Every Thanksgiving, something comes up that prevents me from cooking for our family. When I was in grad school, it was papers and projects that were due after the holiday weekend, then we lived out-of-state for a few years. When we finally moved back home, I was ready to cook up a Thanksgiving feast, but pregnancy-related nausea and food aversions got in the way of my plans. But this year is the year! So the pressure is on. My main objective is to find some new and different recipes to try that aren’t so new and different that everyone will hate them. Bonus points for things that can be made in advance and that don’t require a ton of ingredients—with an active 5-month-old hanging out with me while I cook, anything that needs a lot of time and labor is a no-go. 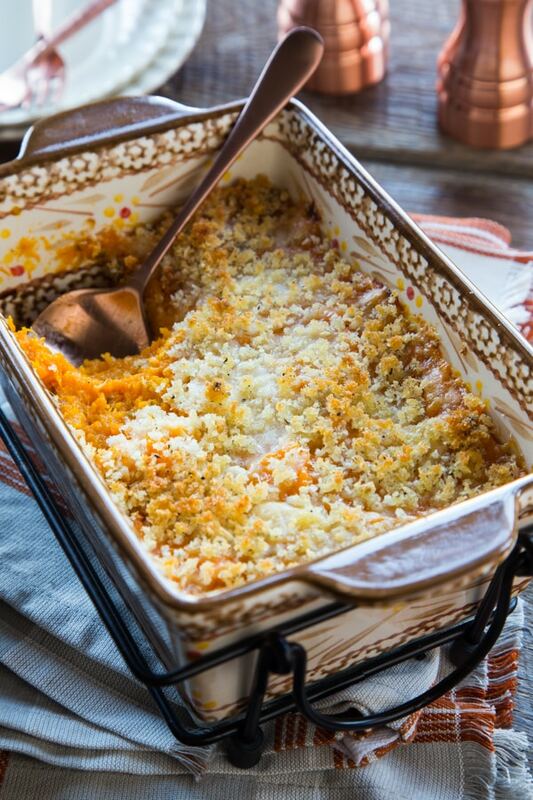 This Butternut Squash Casserole hits all of those prerequisites. Butternut squash isn’t something my family usually has on Thanksgiving, but this casserole is a more savory spin on the traditional sweet potato casserole that’s a holiday staple in so many households—it’s different, but not in a “hey guys, here’s a platter of kohlrabi!” way. If you like your squash on the sweet side, you can even add a touch of maple syrup to it before transferring it to the casserole dish and finishing it off with a cheesy-and-crispy panko topping. Everyone loves cheesy and crispy! This casserole is easy to make in advance too. You can make the butternut squash filling, pop it in a freezer bag, and keep it frozen for up to 2 months. Alternately, you can assemble the entire casserole, cover it, and keep it in the refrigerator for a day or two. When cooking, add 5-10 minutes to the baking time to ensure that it’s heated all the way through. 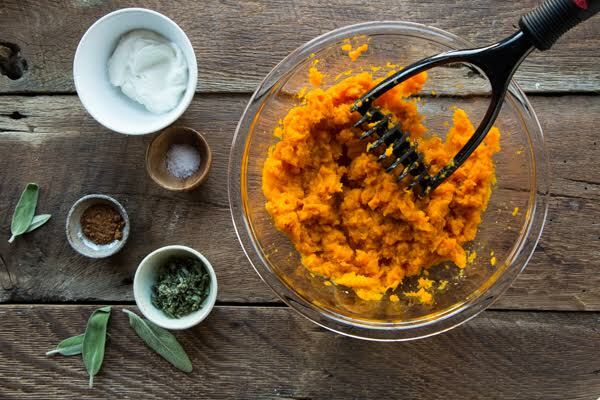 A savory butternut squash and sage casserole with a crispy panko topping. Line a rimmed baking sheet with parchment paper. Place the squash cut-side-down on the baking sheet and bake for about 40 minutes, or until tender and easily pierced with a fork. Remove the squash from the oven and let it cool slightly. Maintain the oven temperature. Lightly spray a small baking dish with olive oil. Transfer the squash mixture to the baking dish, then top with the cheese. Stir together the panko, olive oil, black pepper and a pinch of salt in a small bowl, then sprinkle on top of the casserole in an even layer. Place the baking dish in the oven and bake for about 20 minutes, or until heated through and the panko topping is golden brown. I’m not a huge fan of overly sweet sweet potato casseroles, so this sounds perfect. I think I have to add it to my menu.